She admits, as part of the deal, according to a copy obtained by ABC News that is expected to be filed to the court, that she and an unnamed "U.S. Person 1," which sources have identified as longtime Republican operative Paul Erickson, with whom she had a multiyear romantic relationship, "agreed and conspired, with a Russian government official ("Russian Official") and at least one other person, for Butina to act in the United States under the direction of Russian Official without prior notification to the Attorney General." Based on the description, the "Russian Official" appears to be Alexander Torshin, deputy governor of the Russian Central Bank and a close ally of Russian President Vladimir Putin. Under his direction, the agreement said, she "sought to establish unofficial lines of communication with Americans having power and influence over U.S. politics." It is unclear what Butina's cooperation might entail, but federal prosecutors have reportedly notified Erickson that he is a target of an ongoing investigation. The target letter sent to Erickson is from federal prosecutors in Washington, sources familiar with the case told ABC News, and separate from any South Dakota-based federal fraud investigation into his business dealings that has been the subject of earlier media reports. Butina's attorney, Robert Driscoll, declined to comment. Bill Miller, a spokesman for the U.S. Attorney's office, declined to comment. An attorney for Erickson declined to comment. Butina was arrested in July and accused of ensnaring Erickson in a "duplicitous relationship," using him for cover and connections as she developed an influence operation designed to "advance the agenda of the Russian Federation." She pleaded not guilty to charges of conspiracy and failure to register as a foreign agent. But now, according to the agreement, Butina has acknowledged that with U.S. Person 1's assistance, she drafted a proposal called "Description of the Diplomacy Project" in March of 2015 which was later sent to the Russian Official, in which she said that she had already "laid the groundwork for an unofficial channel of communication with the next U.S. administration" and requested $125,000 from a Russian billionaire to attend conferences and meetings to further develop those ties. The Russian Official, the agreement said, confirmed that her proposal would be at least partially supported. The government has alleged that U.S. 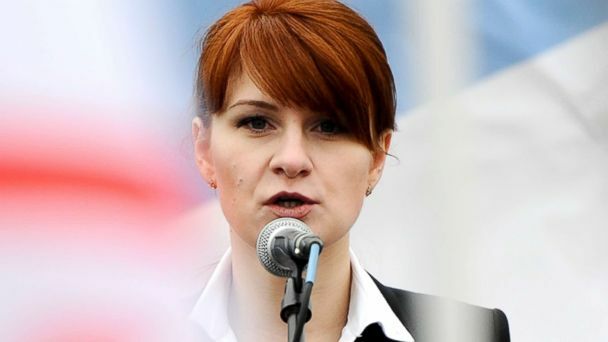 Person 1 "worked with Butina to arrange introductions to U.S. persons having influence in American politics," including high-ranking members of the National Rifle Association and organizers of the National Prayer Breakfast, that would ultimately give her a surprising level of access to conservative politicians, including - in one memorable interaction captured on video - to then-candidate Donald Trump. Most notably, Butina's Russian gun rights group "Right to Bear Arms" hosted a delegation of former NRA presidents, board members and major donors in Moscow in 2015, where she appears to have succeeded in arranging a meeting between NRA insiders and Russian Foreign Minister Sergey Lavrov, raising the prospect of a discussion between conservative political operatives and a powerful member of Russian President Putin's inner circle in the midst of a presidential campaign. After that now infamous meeting, the agreement said, Butina sent the Russian Official a message, which was translated as saying "We should let them express their gratitude now, we will put pressure on them quietly later." "Unrelated to specific presidential campaigns," Erickson wrote in an October 2016 email to an acquaintance that was later obtained by the FBI, "I've been involved in securing a VERY private line of communication between the Kremlin and key [unnamed political party] leaders through, of all conduits, the [unnamed gun-rights organization]." And during an FBI raid of Erickson's South Dakota home, investigators discovered a handwritten note suggesting Erickson may have been aware of a possible job offer from Russian intelligence services: "How to respond to FSB offer of employment?" Erickson scratched, an apparent reference to the Russian equivalent of the CIA. Butina's attorney Driscoll has described her as a promising graduate student whose career has been derailed by this case, but prosecutors claimed that was just a "cover while she continued to work on behalf the Russian Official." Butina allegedly maintained that cover with the assistance of Erickson. He supported her financially, telling McClatchy DC he established a South Dakota-based company Bridges LLC with Butina in order to help defray her educational expenses, and according to court filings, assisted with her coursework "by editing papers and answering exam questions." Meanwhile, prosecutors claim, Butina "appear[ed] to treat [her relationship with Erickson] as simply a necessary aspect of her activities" and privately expressed "disdain" for continuing to live with him. Driscoll, however, had insisted that Butina and Erickson, despite the government's claims to the contrary, were engaged in a mutual and genuine cross-cultural romance. "I think in some ways it's a classic love story," Driscoll said. "I think [reporters] are filling in a lot of the gaps with a lot of spy novels."